The first time you run the Z1 Dashboard software you will be asked if you would like to register your copy of the software. There are three ways to register the software. The first is to enter your order number. This is the preferred method of registration and will allow you to use the software online and offline with all supported sims. The second method is used in conjunction with the Z1 Server application. If you will be connecting to a registered Z1 Server, then you should use this method. 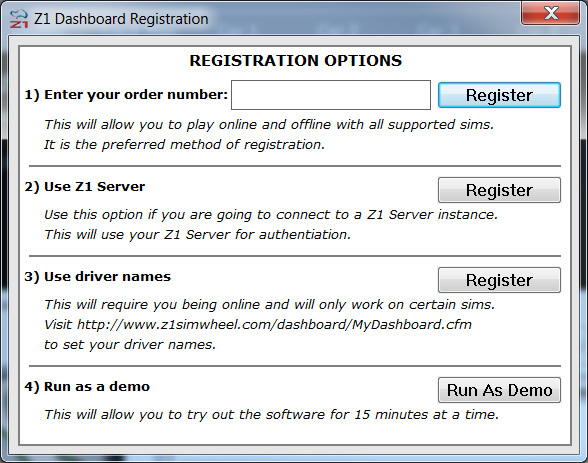 The third method allows you to use the your driver name within the sim to register the software. You can use this method if the first two methods does not work for you or you do not have your order number. Note that this method works with only certain sims and requires that you play them online. To set the driver names you may use, click here and enter your order number. In order to register the software your must be connected to the internet. If you need to retrieve your order number you may do so on this page. To run the demo version of the software click the Run As Demo button. This will run the software as a demo. The demo version of the software is a fully functional version which will allow you to use all aspects of the software. After 15 minutes of use the software will automatically quit. You can then restart the software for another 15 minutes. You may unregister the software by clicking the About button in the settings dialog. That will display a screen that allows you to unregister your software. If you are going to move the software to a different computer you will need to unregister it from the first computer before moving it.